The Curveball sets up various EQ curves using a simple to understand 3-band active EQ, so its flat when set straight up. The all important Mid frequency is selectable using the Mid switch, to easily simulate 3 band passive EQs from classic US amplifiers, UK amplifiers, and the Thrash EQ setting puts the middle right in the sweet spot for metal. The Mid knob also boosts in a peaky way through that same frequency range, making this a great way to get great parked wah tones by boosting it. Its also easy to boost some mids when changing to a second guitar that is hollow and hard to match up to your rig. 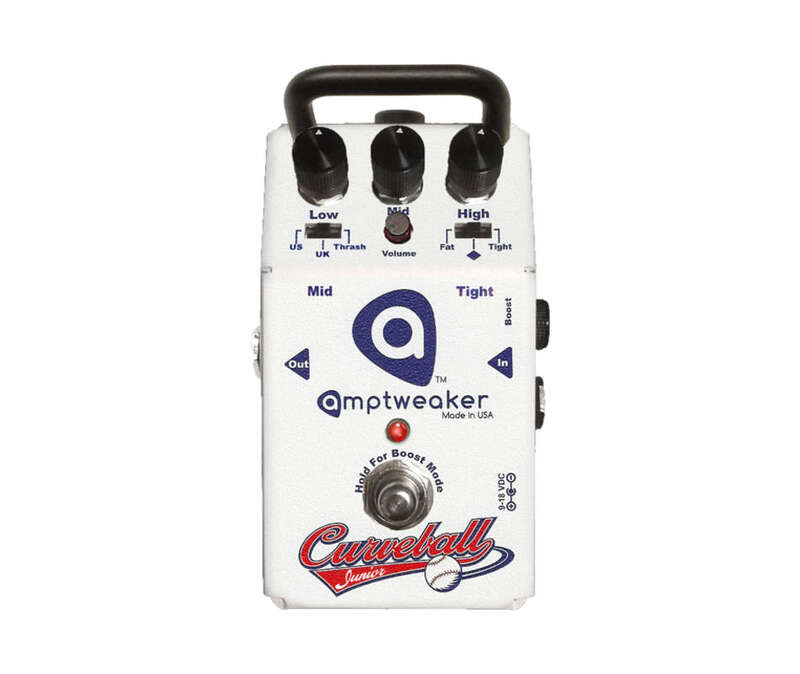 The Curveball can be used in front of distortion to add more gain while tailoring the attack and thickness of the distortion, and Amptweakers Tight switch helps dial that in with the Fat-Normal-Tight settings. The Low knob boosts in a shelving way, but cuts more like a Tight control so you can further optimize the attack. The High EQ also boosts in a shelving way, but rolls off highs more like a guitar tone control. This provides the most flexibility in tweaking your front end boost. The secondary boost feature is a great way to either make up for two different guitars or set up two different boost amounts. By pressing and holding the footswitch, the LED changes from Orange to Green to let you know that the EQ is locked ON, and the secondary boost is primed and ready to go. Press the footswitch again and the LED turns red, and gives you up to 10dB of additional boost. This works exceptionally well after distortion, since you can use it for solos to give you a noticeable volume increase. Used in front of distortion, youll get a secondary heavier gain boost than with it off. And lastly, the Curveball makes a perfect companion since you can easily get great clean tones with it. Patch it into your TightMetal Pros SideTrak loop, and then run into the power amp, and the Curveball will work as your clean tone when the TMP is off. You can even get some distortion from it if you run it at lower voltages, but for the cleanest tone use 18V.